I read my first of his when I was 14 and I think some of it went over my head. I’ve read more since and it’s been enjoyable. Happy Wednesday! I wasn’t aware that one Will was so opposed to the conventions of writing! It’s been a bit difficult but I think I’ve figured it out, much like I would if I read it in English. Happy reading! Just saw coming attractions for the film version of Where’d You Go, Bernadette, starring Cate Blanchett. I’m thinking of squeezing it in before the movie comes out. Let us know what you think! I’ve got a novel and a biography on tap this week. I’ll be sure to! Is it going to theaters or streaming? Happy reading! I enjoyed Where’d You Go, Bernadette, bit of a different read than my usual choices – in a good way! Hope you like it! Thank you! It’s been enjoyable so far, I like the style. Happy reading! It’s been quite a while since I last read a Dan Brown book but I enjoyed them a lot back in the day. I read one every few years and it’s usually a good time. Happy reading! I’ve seen Where’d You Go, Bernadette around and I just recently found out that it’s gonna be adapted into a film (thank you for that, goodreads). Maybe maybe.. I’ll read this way before the movie comes out. Sounds like I’ve got great timing on that one! Awesome. I like it a lot so far. Happy Wednesday! I think I’m caught up after this one… I hope haha. Happy reading! Two book reviews up this week, and it’s only Wednesday!! I’m impressed! Thank you! I’m a bit behind with them haha. Happy reading! I will be taking part in this next week, I just saw it from a blogger I follow today, how interesting!!! So quickly: I just finished The Innocent by David Baldacci, I’m currently reading The Wedding Guest by Jonathan Kellerman, and I want to read Silent Patient next! Thanks for joining in! I’ve never read Baldacci but please don’t tell my mother haha. She’s a huge fan. Happy Wednesday! I like his comedies. Maybe try Much Ado About Nothing? Happy reading! Of course! The more the merrier. Happy Wednesday! They’re my least favorite, honestly. I prefer the comedies. Happy reading! I’ve never read a Dan Brown book, buy my dad has enjoyed them! Maybe it’s time I put one on my TBR! They’re fun thrillers to be sure. I hope you’d find one to enjoy. Happy reading! He ended up finishing it before me and couldn’t wait to talk about it. We enjoyed the discussion. Happy reading! You have some great current reads going on! I haven’t read Origin yet, but I want to. I love hearing it’s good so far. Happy reading! I’ll squeeze in a few pages soon. Must utilize the lunch break! Happy reading. Welcome! Always glad to have new people join us. Happy Wednesday! I think it’s been five years for me. Happy reading! Deception Point is in my top 10 favorite books!! It’s been more than a decade since I read that, haha. I can’t remember what I thought of it. I always hear such mixed things about Dan Brown, I’m not sure if I’ll ever get around to checking out his work. I continue to admire your Spanish reading endeavors. I always had trouble with second-language classes. I like him, but he’s not a favorite. I think spacing out the reading makes it more exciting. YA books make reading in another language a lot easier! Happy reading. 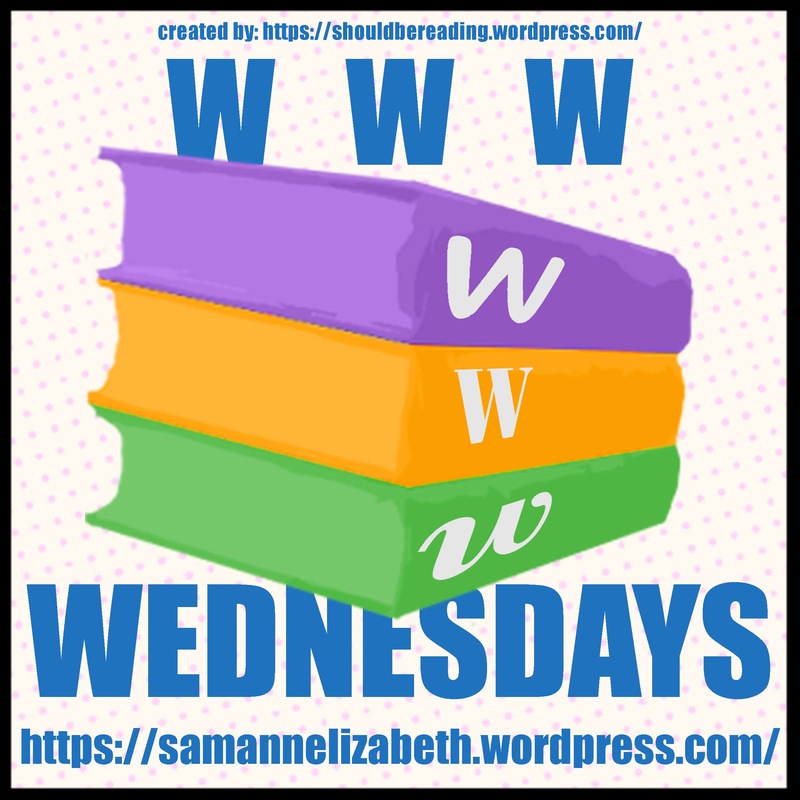 Here’s my first go at WWW Wednesday! Sorry for the delay! Your comments won’t be delayed again. Happy reading! Sounds like we’re similar. There are very few nights I fall asleep without reading first. Happy reading! Great books though Dab Brown is not a really good writer. My opinion. I see the flaws but I still enjoy the story. Happy reading. The audio has been great! I’m loving this narrator. I hope you can give Before the Fall another try. Happy reading! She’s a perfect narrator for the book! I definitely will give it another try! Thanks, you too! I’m full of admiration for you reading a book in another language. It’s a push to keep he skills from school! Happy reading. I’ve never actually read anything by Dan Brown but I feel like I’d really enjoy it. I want to add some to my TBR but at this point…where do I start?! Angels and Deamons is the first Langdon book. I really enjoyed it as well. Happy reading! Kiss Carlo sounds like a good one! Hope you enjoy it. Thanks. I’m a little skeptical because I don’t tend to read romance. Happy reading! I’ve heard of Before The Fall but I haven’t read it (yet), will be interested to see the review! It will be up tomorrow and I’ll have a book club reflection up in the next week or two. Happy Wednesday! It’s been years since I read Dan Brown (and I only read Angels & Demons). I’m really intrigued by Bernadette as I’ve heard good things! I’m still working through a similar list from last week, but managed to finish a couple audiobooks and start a re-read today, so I delayed my post until tonight. I’m surprised it took me this long to get to Bernadette but I’m glad I’m finally reading it. Happy reading! Ooooooh reading in Spanish sounds challenging but also so good/amazing! I wish I remembered enough Spanish (or learned enough Chinese) to be able to read in a different language. Right now I can barely translate the ads on the subway! I got my degree in Spanish but I don’t have a lot of opportunities to use it so reading like this helps me refresh myself. Happy reading!